Charlotte's newest tower opens Tuesday. Here's a first look at the hotels in it. Charlotte’s newest tower opens Tuesday above the Epicenter in uptown on Trade Street. The 22-story tower will house two hotels with a combined 300 rooms and Nuvolé Rooftop TwentyTwo rooftop bar that will open to the public in late September on the 22nd floor. The top floor will also have a penthouse suite. Guests will enter the hotels at 220 E. Trade St. and enter a shared lobby for the two hotels. From there, guests can take an elevator to the lobby to their respective hotel — either the AC Hotel or Residence Inn Charlotte City Center. The developers did not release a total project cost. Above the Epicenter, floors 5-12 are part of the AC Hotel, with 184 rooms. The AC Hotel has “hydration stations” that feature bagged ice and a carafe guest can fill with water. The hotel will also feature the AC Lounge, which is open to the public and will have daily breakfast and small plates and cocktails, beer and wine. The two hotels will share a laundry space, dog walk and 24-hour fitness center. Meeting space will also be available for business meetings or weddings. Floors 14-21 house the Residence Inn, which will feature 116 rooms with a mix of apartment-style suites — studios, one and two bedroom options, aimed at attracting extended-stay residents. Rooms for the Residence Inn will start at $259 a night and rooms for The AC Hotel will start at $279. Throughout the hotels, artwork by more than 20 local artists will be featured. McKibbon Hospitality and Charlotte’s Vision Ventures partnered on the development of the project and the general contractor was Cleveland Construction. The site atop the EpiCentre was originally planned to be a 51-story condominium tower, before the economic crash in 2008 and ensuing recession. That project stalled, and for years the steel rebar poking out of the entertainment complex’s roof was a visible mark of the recession’s impact. This rendering shows the planned, $84 million hotel and conference center at UNC Charlotte. For years, Charlotte tourism leaders have worked with city government to build an indoor sports complex to help recruit amateur tournaments and competitions — and bring in young athletes and their families from far-flung locales to spend money on hotel rooms, restaurant meals and so on. To date, those plans have fizzled. On Monday, that problem could be at least partially solved — or improved, anyway. City Council expects to vote on a request for $8 million to help pay for an $87 million hotel and conference center at UNC Charlotte, with the government portion coming from existing tourism taxes. If approved, the 226-room Marriott would open in time for the 2020 school year. To sweeten the deal initially presented to council in June, UNCC has agreed to add five rent-free dates per year for its various on-campus sports venues, such as the 9,000-seat basketball arena and the 15,000-seat football stadium. Ron Kimble, a consultant on tourism projects for the city and the visitors authority, told CBJ that the rent-free use of athletic venues and a companion commitment to grant the city access to a block of up to 100 rooms for major conventions in uptown were negotiated in recent weeks as the two sides worked to enhance the initial terms. Those provisions would be in addition to the city owning the 24,000-square-foot conference center at the hotel and leasing it back to the Foundation of UNC Charlotte, the developer of the project. Dubois and others at UNCC want to build the hotel and conference center to bring in more academic and research symposia, a goal that would be assisted by being able to host those events near campus and with the capability of housing any visiting professors, experts and attendees. And, because the proposed 4.4-acre site is at the just-opened light-rail line stop at J.W. Clay Boulevard and North Tryon Street, the conference center and hotel can also be used for uptown events because of the access provided to the center city on the train. Tourism executives tout that connection as a way for visitors attending uptown conventions and other events to find more attractive room rates by staying beyond the center city but with minimal inconvenience since the light-rail line provides affordable and convenient travel back and forth. The UNCC foundation will pay the remaining costs other than $2 million from Marriott. City money will be used only to build the conference center, not hotel rooms. Actual construction costs are $52.5 million: $8 million for the conference center, all paid by the city, and $44.5 million for the hotel. A 132-space parking deck is also planned for the site. For all of the construction — the privately funded hotel and publicly financed conference center — there is a guaranteed vendor spending range of 10% to 15% for small businesses and for minority-owned firms. Kimble, the consultant, said that is different from standard agreements, which usually apply only to the public portion of a project. Council will vote on both a rezoning request to build the hotel on the foundation-owned land and the $8 million in tourism tax money for the conference center. According to city estimates, the hotel and conference center will add $9 million in combined city, county and state tax revenue during the first five years it’s open. The city’s payments would be divided in equal halves of $4 million with the first installment in July 2019 and the second after the project opens. UNCC would lease the conference center for 30 years, plus up to two, 10-year extensions and the option to buy the conference center at market rates after year 30. Kimble said the use of UNCC’s athletic fields and arena would not erase the need for a city-backed indoor sports center as well as baseball and track and field complexes, but it would enhance the city’s amateur sports offerings in the interim. The visitors authority is also in line to receive rent-free dates as part of a county-led $35 million makeover of Memorial Stadium near uptown. That renovation includes a city contribution of as much as $3 million for an artificial turf field. A dual-branded hotel development in uptown is scheduled to open in two weeks after facing numerous challenges since the project's inception, including a legal dispute over air rights, a failed condo project leftover on the site and construction delays. The 22-story AC Hotel and Residence Inn Charlotte City Center above the EpiCentre at 210 E. Trade St. is set to open in late August, according to developer McKibbon Hospitality, though an exact date was not disclosed. The hotels were originally estimated to be complete in late 2017 before the expected completion changed to February of this year, which then got pushed back to this spring. Florida-based McKibbon Hospitality is developing the two hotels in a joint venture with Vision Ventures, a local real estate firm. Karl Oates, vice president of lifestyle hotels for McKibbon Hospitality, said late Monday that the dual-branded tower is a large project that sits on a complex site. "Given these factors, some delays were to be expected, and some unexpected issues arose," Oates said, though no specifics on the issues were disclosed. "We worked through these issues and have been working closely with the city to stay on track as we move towards completion." The dual-branded Marriott hotels include an 184-room AC Hotel — Charlotte's first — and a 116-room Residence Inn as well as a rooftop bar and lounge, Nuvole Rooftop TwentyTwo, which Asheville restaurateur Peter Pollay is consulting on in partnership with McKibbon. Nuvole is expected to open shortly after the hotels' openings, according to McKibbon. The top floor also includes an independently operated penthouse suite with two bedrooms and two-and-a-half bathrooms. McKibbon and Vision held a "skybreaking" ceremony for the project in January 2016. At that time, the hotels were expected to be finished in late 2017. John McKibbon, chairman of McKibbon, said at the skybreaking that the project was probably "the largest and most complicated" so far for the company, which has done a number of urban hotel projects. The tower topped out in December 2016, a milestone that signals the end of vertical construction and is usually seen as the halfway point of construction on a real estate development. The site where the AC Hotel and Residence Inn are under construction faced a number of challenges even before construction began. A lawsuit between Mount Vernon Asset Management and Vision Ventures over air rights above the EpiCentre that alleged fraud was settled in late 2015. And two partially built floors of a failed condo project, 210 Trade, remained on site where the hotel tower was pegged. Gregg McAllister, vice president of development at Vision Ventures, previously said the developers used the already-constructed condo structure for the AC Hotel footprint. The timetable for acquiring a site to build a proposed, 1,000-room convention hotel in Charlotte is likely to be pushed back by at least several months as tourism executives focus on higher priorities, a city consultant told CBJ on Monday. In May, as part of a presentation on investments targeted by the Charlotte Regional Visitors Authority, Ron Kimble, a consultant to the tourism agency, said City Council would be asked to consider options for a convention hotel — a long-discussed project anticipated to include a request for $100 million in taxpayer money to help pay for construction costs. Kimble told me Monday afternoon that his previous remarks about a possible consideration this summer by council involve buying and preparing a site. Now, he said, it looks like council and the visitors authority will push those conversations to the end of this year or early in 2019. CBJ reported in May the visitors authority expects to spend as much as $30 million to buy the land and prepare the site for a convention hotel. If council approves public funding for a convention hotel, the money would be repaid using a portion of existing tourism tax revenue. • Contributing $8 million from existing tourism tax money to help pay for a proposed, $84 million hotel and conference center on the UNC Charlotte campus. Council is expected to vote Aug. 27 on possible city investment. • Determining the parameters of the next round of improvements and renovations at the NFL stadium in uptown. The Carolina Panthers own the 74,000-seat stadium, but city government paid for $75 million of the team’s $177 million, five-year stadium facelift started in 2014. New team owner David Tepper is expected to request additional public money for additional improvements. Kimble has used $75 million as a “placeholder” figure for what the city might agree to pay. • Winning approval for yet-to-be-negotiated construction contracts to begin work on $110 million worth of convention center renovations previously endorsed by the council. • Determining the schedule, scope and other details for an estimated $30 million worth of improvements at the city-owned Discovery Place Science museum in uptown Charlotte. Kimble said the slight shift in timing for buying the hotel site won’t delay the project because a developer wasn’t going to be selected until 2019 anyway. Tom Murray, visitors authority CEO, has said the best location for a 1,000-room hotel is near the convention center, located on College Street and bounded by Stonewall and Brevard streets and Martin Luther King Jr. Boulevard. Supporters of a 1,000-room hotel cite the need for event planners to be able to negotiate discounted room rates with minimal hassle and at one location (as opposed to multiple hotels) as keys to landing more conventions. The largest hotel in Charlotte is the 700-room Westin, opened in 2003. Some council members have questioned public investment in a convention hotel, saying it undercuts private hotel developers and operators. Murray and the visitors authority, citing examples and analysis from similar-sized cities, say a convention hotel would bring in and target a different audience, leaving ample demand for other hotels. Kimble told Mayfield a convention hotel would allow planners to reserve as many as 700 or 800 rooms years in advance and at more attractive rates. Private operators are less willing to risk blocking off a large number or all of their rooms at prices that might wind up being much lower than the going rate. Regardless of whether the land was in place this summer, there was no way the 1,000-room hotel would have opened in time for the 2020 Republican National Convention. Cleveland opened a 600-room, $275 million Hilton — paid for by the county — just before the city hosted the 2016 RNC. 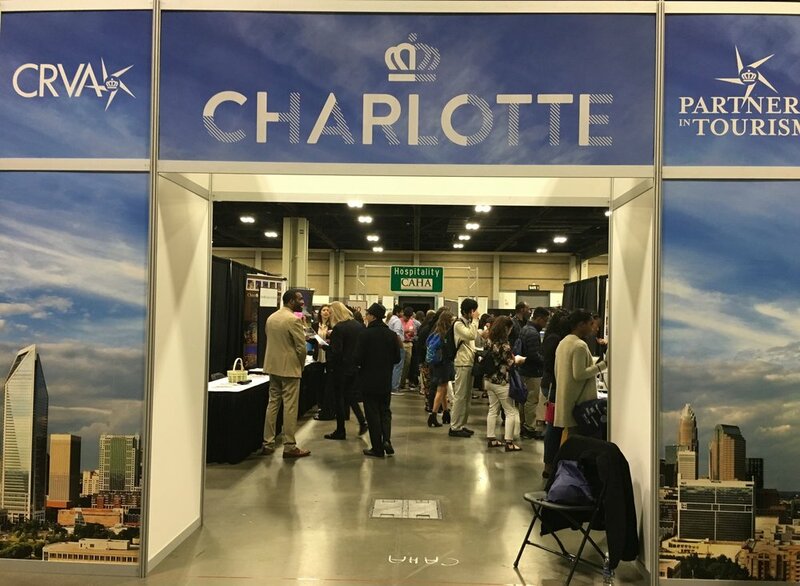 Charlotte was selected as the 2020 convention site last month. Another hotel flag new to Charlotte appears to be on track for a SouthPark opening within the next two years. Canopy by Hilton is expected to open in early 2020 at 6010 Fairview Road, according to a list of upcoming locations on Canopy's website. The 2.8-acre site, which sits behind Fairview Towers, is part of a larger site approved in 2016 to allow development of a mixed-use project, including a new hotel. Wilmington-based Liberty Healthcare Management is developing a senior-care facility, The Barclay at SouthPark, on an adjacent parcel. Charlotte-based Tara Investments, which specializes in hotel development, lists the Canopy SouthPark hotel in its portfolio, indicating that it's set to break ground this summer. Tara has developed several hotels across the Southeast, with flags including Hyatt Place, Homewood Suites by Hilton and Hampton Inn and Suites. Elsewhere in Charlotte, Tara developed the Homewood Suites in Ballantyne. Tara is also seeking to build a Canopy hotel in downtown Nashville, Tennessee, as reported by the Nashville Business Journal, a sister publication of the Charlotte Business Journal. Hilton Worldwide Holdings (NYSE: HLT) and executives with Tara could not be reached by deadline for more information on the SouthPark Canopy hotel. Hilton last year opened two flags in SouthPark — a 160-room Hilton Garden Inn and a 110-room Homewood Suites developed by Crosland, Allen Tate and Chartwell Hospitality. Also in SouthPark, an AC Hotel by Marriott is pegged for the corner of Roxborough and Rexford roads, adjacent to the existing Charlotte Marriott SouthPark. A construction permit by Barringer Construction was recently filed for that site, at 2200 Rexford Road. Charlotte's first AC Hotel in uptown is expected to open next month, according to its website. Canopy is described by Hilton as a boutique, lifestyle flag. The company lists six hotels in operation — in Washington, D.C.; Maryland; Portland, Oregon; Dallas; Atlanta; and Iceland. Another 16 hotels, including the SouthPark location, are listed as opening over the next three years. Charlotte has the Central Intercollegiate Athletic Association basketball tournament for at least two more years, but a decision this month by the conference to field bids from other cities put local leaders on notice they likely face a tougher road to keep it. On Monday, members of City Council discussed expected competition for the tournament — an event that brought $29 million worth of spending and 131,000 visitors to town this year. The Charlotte Regional Visitors Authority, the agency that recruits and promotes tourism events, plans to formally notify the CIAA of its forthcoming tournament bid on Tuesday — the deadline for all prospective sites to make their interest known. Bids are due Sept. 9. On Dec. 14, the CIAA board will name its host city for the 2021, 2022 and 2023 tournaments. Beyond hearing about the tourism value and making vows to fight for the event, council members emphasized what they portrayed as Charlotte’s favorable odds for retaining the CIAA. Council’s economic development committee heard a presentation about the benefits of the men’s and women’s tournaments, played in Charlotte every year since 2006, while also mulling anticipated interest from Atlanta, Baltimore, Richmond and Winston-Salem. The CIAA is comprised of 13 historically black colleges and universities. Eight are in North Carolina, including Johnson C. Smith in Charlotte. The current contract between the conference and the city ends in 2020. Local government provides $2 million annually in subsidies to the tournament, including scholarship donations, free use of the convention center and paying the operating costs at Spectrum Center and Bojangles’ Coliseum. Egleston’s district includes both of the arenas where CIAA tournament games are played. Committee leader James Mitchell warned of an insurgent campaign among the four member schools located in the northern portion of the conference’s footprint: Bowie State (Maryland), Lincoln University (Pennsylvania) and Virginia State and Virginia Union. 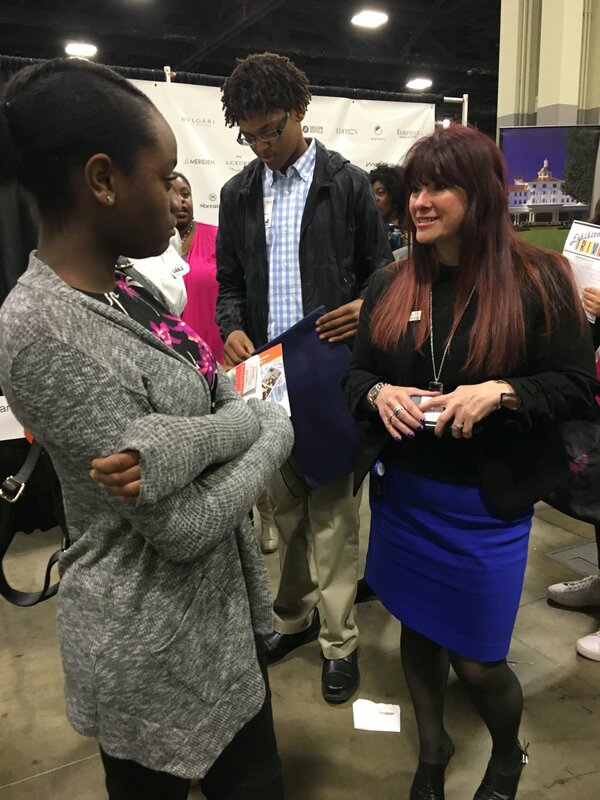 Jacqie McWilliams, the CIAA commissioner, recently told Mitchell those schools want to see the basketball tournament played closer to their campuses, Mitchell said Monday. The councilman said Baltimore could be of particular concern since Caesars Entertainment opened the city’s first casino there in 2014, located near the tourist-friendly Inner Harbor. Mike Butts, vice president of sales at the visitors authority, reviewed the latest economic impact study for the CIAA, based on 600 surveys of fans who attended the 2018 tournament between Feb. 27 and March 3. Based on those responses, the visitors authority and the CIAA calculated an overall benefit of $50.5 million, including spin-off benefits from visitor spending. Direct spending — money spent by visitors on hotel rooms, meals, transportation and other expenses — totaled $28.8 million, an increase of 6.7% over 2017. The CIAA tournament is the city’s most lucrative recurring tourism event, according to the visitors authority. “It’s a great piece of business,” Butts told the committee. According to the latest survey results, 68.8% of tournament attendees are alums of CIAA schools and 39% live in North Carolina. Conference executives have pushed for lower hotel room rates for years in Charlotte. Industry analyst STR reported hotel rates decreased in 2017 and again this year, down from peak rates of $269 in 2016. Last year the peak room rate was $255; in 2018, it fell slightly, to $252. Steady growth in new hotels uptown played a key role in a jump in CIAA tournament occupancy in the center city this year, according to STR figures. In addition, while peak rates declined, hotel premiums during tournament week remained well above typical prices in uptown ($200 to $252 per night versus non-CIAA averages of $184) and countywide ($137 to $164 versus $121). Two other councilmen who aren’t committee members — Tariq Bokhari and Braxton Winston — also sat in on the economic development meeting. Bokhari, one of two council Republicans (Ed Driggsis the other), and Winston pressed visitors authority business analyst Heath Dillard on the methodology of the impact estimates for the CIAA Tournament. Winston asked whether allowances are made for business lost during the tournament, such as companies and workers who may change their behavior patterns in uptown because of the crowds. Dillard said the studies don’t account for displaced workers and customers. Winston also hopes to get more detail on which businesses and workers benefit, posing a hypothetical question about whether a restaurant rented out for a private party helps or hurts bartenders, who often rely on customer tips. And so on. Bokhari said that while he remains confident the CIAA produces sizable net gains for the city, parsing the details and methodology would be valuable, particularly with inevitable debates coming over the benefits of hosting the 2020 Republican National Convention. Construction financing has been secured for a new hotel in uptown Charlotte. A $28 million construction loan has been arranged for a joint venture that's building a 176-room Even Hotel at the Stonewall Station mixed-use development. Georgia developer Mayfair Street Partners and Florida real estate private equity group Sefira Capital are developing the hotel, which is being built using modular construction. Mark Ebersold at NorthMarq Capital arranged the construction loan on behalf of the borrower through a local bank lender and a New York-based mezzanine lender. NorthMarq is a commercial real estate financial intermediary based in Minneapolis. The Even Hotel is one of two hotels to be built at Stonewall Station. It will be developed on a 0.4-acre site fronting Caldwell Street while another developer, Alabama-based Yedla Management Co., is spearheading a 180-room Home2 Suites by Hilton hotel next door at the hard corner of Stonewall and Caldwell streets. The hotels represent the last phase of the mixed-use Stonewall Station project, which also includes a 36,000-square-foot Whole Foods Market that opened last month, additional retail space to be leased, Crescent Communities' 458-unit apartment development and a 1,350-space parking deck. Charlotte-based Asana Partners recently acquired most of the retail at Stonewall Station, including Whole Foods, for nearly $34.1 million. Mayfair acquired the hotel site last summer for $4.5 million. The Even Hotel, Charlotte's first, will include a fitness center, healthy food and beverage options and in-room fitness, true to the flag's wellness focus. Convention bid now in question? While a Charlotte delegation is planning to make the trip to Austin, Texas, later this month where the Republican National Committee is expected to pick the host city for the 2020 Republican National Convention, it's now not clear Charlotte's bid will have the full support of city government. According to several media reports, some Charlotte City Council members are unsure how they will vote when bid comes before an open council meeting. So far, all council discussions of the bid have been behind closed doors. Lawana Mayfield is the only council member who has publicly expressed opposition to Charlotte's bid, WSOC-TV reports. The station says liberal activists plan to protest the convention bid at future council meetings. The Charlotte Observer reports another council member, Justin Harlow, a Democrat representing northwest Charlotte, is concerned about protests. At-large council member Democrat Braxton Winston said in a Facebook video that the decision to host the convention should be about more than economic development. The Charlotte City Council has a 9-2 Democratic majority. Mayor Vi Lyles announced her support the the RNC 2020 bid in February. “I think we’re going to have an opportunity to once again showcase our great city,” Lyles said at the time. NCGOP Executive Director Dallas Woodhouse, who has worked with Charlotte on the bid, said in a statement: "We are proud of the strong partnership between NCGOP, city, county and tourism officials to bring N.C. and Charlotte the 2020 RNC Convention. N.C. should be proud so many can set politics to the side for economic development opportunities." The GOP hosts its quarterly meetings in Texas starting July 18. Ronald Reagan still lived in the White House when UNC Charlotte first added an on-campus hotel and conference center to its wish list. Now, the reality of such a project could be little more than two years away. On Monday, UNCC chancellor Phil Dubois and representatives from the Charlotte Regional Visitors Authority made a joint pitch to City Council for the long-sought hotel and conference center. Under the terms negotiated by the school and the tourism agency, the hotel and conference center would cost $84 million to build and open in time for the 2020 school year. The 4.4-acre site targeted for the project is located at the J.W. Clay Boulevard-UNCC stop on the Blue Line Extension light-rail line, located at the intersection of North Tryon Street. It requires approval from the zoning commission, a process already begun by the university. Of the $84 million construction cost, a portion of existing tourism taxes would account for $8 million. Council would have to approve the visitors authority’s funding for the hotel. A vote is anticipated at the Aug. 27 council meeting. All but $2 million of the remaining $76 million would come from the UNC Charlotte Foundation. The foundation would provide its portion by issuing $45 million in bonds, contributing $9 million in cash and raising $20 million through private investment. Marriott would kick in $2 million. The hotel will be a 226-room Marriott with a 24,000-square-foot conference center and a 132-space parking deck. Dubois and visitors authority consultant Ron Kimble told council the conference center is twice the size of what similar-sized hotels usually build. The reason: Anticipated demand for academic conferences and other events driven by the on-campus location. The visitors authority based its proposed investment in the project on the likelihood of campus conferences and meetings creating demand at nearby hotels in University City, potential bookings for large conventions in uptown because of the easy light-rail proximity carrying convention-goers from the campus hotel to uptown and simulcast connections to UNCC’s center city campus spurring more activity at both sites. Part of the arrangement would include an ownership share for the visitors authority in the conference center’s ballroom and meeting rooms. Terms of that agreement with the university have yet to be negotiated. UNCC’s foundation would own the property and be responsible for its operations and maintenance. Others involved in the project include the university’s trustees board, Stormont Hospitality (development manager), Sage Hospitality (hotel operator), Cooper Carry (architect), Balfour Beatty (general contractor), Hilltop Securities (financial advisors) and Jones Lang LaSalle (market analysis). The $1.2 billion light-rail line connecting UNCC’s main campus and uptown along a nine-mile route opened in March, better connecting the school with the city’s central business district. Backers of the hotel and conference center believe this project will help the tourism sector and UNCC. Based on estimates and analysis compiled by the university’s advisors and partners, the hotel and conference center would add $9 million combined in local and state taxes while creating 210 jobs. Projections for the hotel in its seventh year of operation include $13 million in room revenue, $5.5 million worth of food and beverage sales and a room-occupancy rate of 73.5%. Dubois, the chancellor, told CBJ it’s taken several decades for the conditions at and around UNCC to make the hotel project viable. Growth in University City, surging enrollment near 30,000 students and the light-rail line opened this year make a more powerful case for building the hotel. If council approves the project by the end of summer, plans call for construction to start in January. The hotel would open in August 2020. Also at the council meeting on Monday, members unanimously approved a $20 million police station to be built uptown — a project deferred two weeks ago when some members grew frustrated over existing diversity contracting programs. Since then, council’s economic development committee has expanded its scrutiny of those programs while also deciding not to hold up the police station any longer. Local firm Edifice landed the $20 million contract on Monday and will build the three-story, 31,000-square-foot station at West 5th and West 6th streets. Ed Driggs, a council Republican, said that approving the project this week signaled to the business community the city won’t seek to change terms after a deal is negotiated. Previously, some on council hoped to revamp the diversity program in time to apply new standards to the CMPD station. “We can’t stop everything” until the new standards are finished, Driggs told me. Council moved ahead with a $20 million project connecting Bojangles’ Coliseum and Ovens Auditorium on Monday, approving Barnhill Contracting as the construction firm. Of that amount, construction accounts for $17 million of the budget with the rest going to design fees, pre-construction and other expenses. Odell Associates is the architect. Bojangles’-Ovens and the CMPD uptown station have goals of 14% participation for small businesses and 10% for minority-owned firms. Work on the connector building will start later this year and finish in early-2020; the police station has an anticipated opening date of mid-2020. An uptown hotel that reopened about a year-and-a-half ago as a high-tech testing ground for customer experience is one of two Marriott International properties where Amazon will first bring its smart speaker devices into rooms. Amazon.com Inc. has teamed up with Marriott on the launch of its Alexa for Hospitality experience, which will allow travelers to use Amazon Echo units in their rooms to access hotel information, contact housekeeping, order room service and other hotel amenities as well as play music. Charlotte Marriott City Center at 100 W. Trade St. and Marriott Irvine Spectrum in Irvine, Calif., will be the first to launch Alexa for Hospitality, a feature Marriott hopes to roll out at more select properties across its brands starting later this summer. The Seattle-based tech giant said it's inviting hoteliers beyond Marriott, including vacation rental companies, to add the Alexa for Hospitality feature. A spokeswoman for Bethesda, Md.-based Marriott said the Charlotte and Irvine properties were chosen because they "are hotels where we often feature our latest innovations." No specific date was given for the rollout in Charlotte — only that it would occur this summer. The Marriott hotel in uptown underwent a $40 million makeover in an 18-month span, which included 446 rooms, its front lobby, fitness center and meeting space. Reopened in the fall of 2016, the hotel received new dining concepts including a restaurant, an upscale bar and a coffee shop. It also became an innovation lab, in which customers could test new product and service concepts firsthand while giving feedback in real time. Marriott sold the uptown hotel last summer to the non-traded REIT of W.P. Carey (NYSE: WPC) for $170 million. Amazon has been developing Alexa to expand the use of the voice-controlled device, reports CBJ sister publication the Puget Sound Business Journal. That includes the recent launch of Alexa for Business, bringing the virtual assistant into the office as well as builders now integrating Amazon Alexa into new homes. Amazon said that Alexa for Hospitality has been designed to work with existing hotel technologies in an effort to reduce hoteliers' costs in upgrades. Hospitality providers can also set up the voice-activated devices to let guests control in-room features such as lights, thermostats, blinds and TVs. Amazon said Alexa for Hospitality will soon be able to let customers temporarily connect their own accounts to the Alexa-enabled device in their room, giving them access to play their personal music or listen to audiobooks with Audible. As the NC General Assembly enters the final stretch of its 2018 short session, the North Carolina Travel Industry Association went to work (at CAHA’s request) on a modification to a 2017 law requiring hotels, restaurants and welcome centers to display a controversial human trafficking poster in their lobbies. The law required every hotel and restaurant that holds an ABC permit to display the posters in plain view of the public. While CAHA firmly supports any initiative that helps to prevent human trafficking, the signs did not display a message of welcome and hospitality. NCTIA and CAHA worked with legislative leaders to modify the language in a new bill, Senate Bill 335 (Budget Technical Corrections and Study). The new language now reads: All permittees shall prominently display on the premises in a place that is clearly conspicuous and visible to employees and the public a public awareness sign created and provided by the North Carolina Human Trafficking Commission that contains the National Human Trafficking Resource Hotline information. Senate Bill 335 passed the Senate on Wednesday and was approved by the House on Thursday. The bill is now on Governor Roy Cooper’s desk and will likely take effect without a veto. Barring a veto, the law will now limit the requirement to back-of-the-house display in plain visible view of employees. CAHA leadership is currently meeting with the CMPD to gain a better understanding of the human trafficking issue as it relates to our community and how we might further support initiatives that bring an end to human trafficking. More information will be shared at the CAHA General Manager’s meeting on July 16, 2018 at the Ritz Carlton. General Managers can RSVP online at http://www.charlotteareahotels.com/meetings/. A familiar city consultant and Charlotte tourism executives asked City Council for a combined $7.6 million on Monday to help projects that would upgrade Bojangles’ Coliseum and Ovens Auditorium, buy an artificial playing field for Memorial Stadium and add a pedestrian bridge connecting uptown and South End over Interstate 277. Council will vote on the funding requests on June 11 (the stadium field and pedestrian bridge) and June 25 (the Bojangles’-Ovens additions and related overruns). • Mecklenburg County this year approved spending $32 million of taxpayer money to overhaul its 82-year-old Memorial Stadium, located on the edge of uptown between Central Piedmont Community College and the Elizabeth neighborhood. County leaders want the city to spend $3 million to buy an artificial turf field for the renovated stadium in time for its 2021 opening. Ron Kimble, a former city manager who is now a consultant on tourism and sports projects, touted what would be a $35 million upgrade as a winner for city taxpayers in particular since they would be paying only for the field. Two years ago, a proposed $25 million Memorial Stadium renovation would have cost the city $8.3 million, but the deal later fell apart. In exchange for buying the field, the city would receive five rent-free days at the stadium annually for 15 years. Assistant County Manager Mark Foster told council the stadium’s rental fee is $12,000 a day, plus expenses. Kimble, citing economic analysis by the visitors authority, estimated direct spending of $1.7 million per event, or $8.5 million annually, based on hotels, meals and other expenses for Charlotte’s role as host of Battle of the Bands. Mayor Vi Lyles questioned whether the Battle of the Bands should be used as an average measuring stick, saying it could be difficult to match attendance and interest for that event across the board. • In 2004, when the city was in the final stages of preparing to build what became the 10-mile light-rail line between Pineville and uptown, the project included a pedestrian bridge going over I-277 between uptown and South End, city transportation planning manager Dan Gallagher told council. Budget pressures caused the pedestrian bridge to be scrapped. Now the city, with help from the county, state and private backers, wants to revive the pedestrian bridge. It would cost $11 million, including $3.1 million from city government. Mecklenburg County would kick in a matching $3.1 million, while the state transportation department would contribute $3.3 million. Private donations from companies and nonprofits account for the remaining $1.5 million. According to the presentation, if council approves the funding, construction would begin in 2021. • Council voted last summer to spend $18.5 million on a connecting building between Bojangles’ Coliseum and Ovens Auditorium, both city-owned venues, on Independence Boulevard. The project is scheduled to open in the fall of 2019, with construction beginning this summer. Visitors authority CEO Tom Murray and members of his staff outlined the additions, including restrooms, concessions areas, pre-and post-event hospitality spaces and storage and office expansion. Construction costs will add $500,000 to the price tag, despite shrinking the addition to 35,000 square feet from 45,000 square feet to reduce expenses. Another $1 million is being requested to build a performer’s corridor, something promoters have sought to make it easier for musicians and actors to move quickly and easily before and after shows. Council will decide in two weeks whether to approve the $1.5 million in additional spending, money that would come from existing tourism tax revenue. Council members asked Murray how much additional business the improvements might bring and questioned whether adding loading docks to the buildings might be of greater value. According to the visitors authority, revenue for the two buildings doubled over the past several years, jump-started by the Charlotte Checkers minor league hockey team moving back to Bojangles’ and the city spending $16 million to renovate that arena. In fiscal 2017, Bojangles’ hosted 89 events and Ovens had 106. The two buildings are moving closer to break-even on an annual operating basis, Murray told me Monday. Earlier on Monday, council spent about 90 minutes debating changes to the fiscal 2019 budget. The discussion netted $250,000 more for a program aimed at allowing older residents to stay in their homes (“Aging in Place”) and moving some money around for enhanced police pay raises. Neither move made a significant change to the existing $2.6 billion budget recommended by the city manager, including a proposed one-cent property tax increase, council will vote on the final budget next week. Expect this $110 million boutique hotel to bring a little sparkle — and funk— to uptown. Construction is officially underway on the Grand Bohemian Hotel Charlotte. Plans call for that 254-room, 15-floor hotel to open in March 2020. A groundbreaking was held Thursday, but this is a project three years in the making, says Richard Kessler, CEO of The Kessler Collection. Kessler has been hands-on in the entire process to bring the Grand Bohemian to Charlotte, from choosing the city and site to working with designers on the project. “What we’re building will be here for decades. We’re adding to the city and skyline for decades to come,” Kessler says. He was drawn to the Queen City because of its future potential — and need for a unique hotel. Expect classical architecture and contemporary touches — all with an Argentinian flair. That Orlando, Fla.-based hospitality company acquired a 0.6-acre site next to the Carillon Tower at Trade and Church streets in 2015 for a little more than $3 million. The hotel will have 32 suites. An open-concept restaurant will bring the flavors of Argentina to Charlotte with a steak-oriented menu. A lounge and bar with sidewalk and park seating as well as a Starbucks are planned. The 16th floor will be home to a rooftop bar with views of the Queen City. It also houses the signature Poseidon spa with services such as hot stone massage, lavender peppermint scalp treatment and aqua gel facial masks in addition to a 24-hour fitness center with cardio machines and custom-programmed music. here’s also 18,000 square feet of customizable meeting space for everything from corporate functions and holiday parties to weddings. That includes a mix of indoor and outdoor space with three breakout meeting rooms, a private dining room, a 4,400-square-foot ballroom and as well as a rooftop terrace. Expect rooms to cost in the $300 range, Kessler says. The Grand Bohemian flag is part of Marriott’s Autograph Collection. The Kessler Collection’s portfolio includes nine luxury boutique hotels, including sister properties in Asheville and Charleston, S.C.
A city consultant and the CEO of the Charlotte Regional Visitors Authority said Monday that discussions on a 1,000-room convention hotel will likely shift to selecting a site and beginning talks with prospective developers this summer. Those plans surfaced during a presentation to City Council that outlined anticipated funding needs for a slew of projects in the next five years to be paid for using existing tourism taxes. Tom Murray, the visitors authority executive, last year told CBJ and industry leaders that a convention hotel would make Charlotte more competitive when recruiting conferences and conventions. He reiterated on Monday the need for a large-scale hotel under the tourism arm’s control, allowing the city to contract large room blocks at discounted rates to attract conventions. Though he declined to disclose specific sites, Murray said it would be preferable to locate land adjacent to the convention center. The convention center, opened in 1995, is located on College Street, bounded by Stonewall and Brevard streets and Martin Luther King Jr. Boulevard. No specific amounts were mentioned, but, based on precedents established in similarly sized cities, public money would likely account for 30% or more of a convention hotel. Assuming 1,000 rooms, construction would be in the range of $350 million, meaning $100 million or more could be sought from taxpayers. Rival cities including Austin, Baltimore, Cleveland, Indianapolis, Louisville and Nashville have all planned or opened similar projects with significant public money. Last year, council approved spending $110 million on convention center renovations and expansion to be repaid using a portion of existing tourism tax revenue. A final vote on the construction contracts will be taken this fall. Construction is slated to begin next winter and be finished in 2021. Murray emphasized in a discussion with reporters after the presentation that no agreements have been reached with a hotel developer. A site idea will likely be brought to council later this year. In a presentation last year to industry executives, Murray and others asserted a convention hotel would help existing hotels, citing industry data from rival cities that have recently opened similar projects. The visitors authority CEO pointed to 93 consecutive months of industry growth in Charlotte as proof there is enough demand to absorb a 1,000-room hotel. The city’s first convention hotel, a 700-room Westin, opened in 2003. City money accounted for $16 million of that project’s $143 million cost. In return, city government received use of 500 of the 1,600 parking spaces in an adjacent deck as well as some of the hotel’s conference rooms. “Ideally, it would be adjacent,” Murray said of a 1,000-hotel room. No hotel brands or representatives have been contacted yet, he added. Charlotte has seen a proliferation of new hotels opened or planned in recent years, including an increase of 5.6% in the number of rooms during the past year. The city is considered the likely choice to land the 2020 Republican National Convention since other anticipated contenders declined to submit bids. Last year, Charlotte hosted the PGA Championship and, in February 2019, the NBA All-Star Game will be here. The Democratic National Convention came to Charlotte in 2012. Murray said those successes point to more growth and opportunity in the years ahead — opportunity that requires more rooms and convention space to be fully realized. LaWana Mayfield, a council Democrat, wondered aloud why public investment is needed when private companies are already building hotels without government investment or encouragement. Kimble referred to the need for the visitors authority to have control of blocks of rooms in one location at reduced prices, an offer that is much easier to make for a subsidized hotel. The competition for talent is on as more restaurants stake out their place in Charlotte’s fast-growing dining scene. A shallow labor pool is driving up wages and causing restaurateurs to re-examine benefits and perks to retain employees — all at the cost of the bottom line. Reid herself formerly worked as a chef. The guild works to promote 248 local chefs and farmers, encouraging them to showcase the flavors of the Piedmont by keeping their supply chain local. But rising employment costs are taking a toll on that effort as restaurants balance customer expectations for quality with pricing pressures. A search of Indeed.com produced more than 4,000 restaurant job opportunities here, with options available from fast food to upscale dining. Operators are going to be forced to think outside the box on hiring, Reid says. For example, the guild is exploring community dinners instead of traditional job fairs with a goal of highlighting food and beverage as a fun, community-based industry. “We’re sort of in a labor crisis. Everyone really is struggling and trying to find a solution,” Reid says. Currently, 38% of all restaurant operators nationwide report recruitment and retention of labor is a top concern, says Hudson Riehle, vice president of research for the National Restaurant Association. “With a growing number of restaurants, obviously the underlying labor supply has tightened,” Riehle says. One out of every 10 jobs in the United States is in the restaurant industry where employment is expected to top 15 million in 2018. Hiring has always been a challenge. Now, that’s heightened by increased competition for employees and a shift in workforce expectations, says Frank Scibelli, founder of FS Food Group. For example, these days it’s harder to find employees who want to work nights and weekends while missing time with friends and family. “We’re trying to get more progressive because it’s not going to go away,” he says. His Charlotte-based restaurant group employs roughly 500 at Midwood Smokehouse, Paco’s Tacos & Tequila, Yafo Kitchen and Mama Ricotta’s. Wages are up about 10% in the past few years. The company has added perks such as a 401(k) program, paid vacations, meals and discounts to sister concepts to help attract talent. FS Food Group has a progam that pays prospective employees to come in for the day and shadow staff. “We want it to be a fit our way as well as theirs,” Scibelli says. It doesn’t hurt that wages in the restaurant industry have risen faster than anywhere else in the private sector, Riehle says. That gives employers another tool to increase recruitment odds and retain staff. That wage growth is backed by Indeed’s job listings. Job posts with wages listed topped North Carolina’s minimum wage of $7.25. The soon-to-open Brewers at 4001 Yancey is looking for line cooks, prep cooks and dishwashers. The pay? $10 to $14 an hour. DeSano Pizzeria Napoletana had listings in the $12-to-$15 range for bartenders and servers. And Eddie V’s in uptown was offering up to $18 an hour. An experienced line cook at the soon-to-open Superica can earn up to $20 an hour, says Andy Palermo, senior general manager at Ford Fry Restaurants’ Tex-Mex concepts. The Atlanta-based company enters the Charlotte market later this month with a 7,000-square-foot restaurant in South End. He says well-themed job ads and targeted recruiting trips were key in lining up staff. Superica will have up to 110 hourly employees. Duckworth’s Kitchen & Taphouse recently revamped its Park Road location. A trimmed-down menu and new seating layout helps increase functionality in the kitchen, says Kevin Stevens, district manager and operating partner for Duckworth’s. It also makes it easier to deal with staffing challenges. A recent Duckworth’s ad offers to pay $1 more an hour if an employee brings employment verification. It also gives employee bonuses for referring new hires. “That’s pretty much how competitive it has gotten. You really hate to steal someone from someone else,” Stevens says. Tandur invested more than $1 million into its first location here, which opened last month. The fact this is a new concept to market exacerbated the challenge. Tandur aims to make Indian cuisine more mainstream, but that comes with its own issues. “People can’t wrap their head around an Indian restaurant, fast casual and how does this all work,” Patel says. Hourly positions can pay up to $12, depending on position, with tip sharing as well. But he says creating a culture for employees is most important. Having a fun work environment can help staff deal with busy times and improve the overall customer experience, too. “If you’re having fun, it’s a completely different experience,” Patel says. The Restaurant Association’s Riehle says it is critical to deliver on the dining experience as consumers spend more food dollars eating out. Today, roughly 48% of the food dollar is spent in restaurants — up from 25% in 1955. “If that last restaurant experience for the patron doesn’t meet their value received for price paid, then they can be quite quick to vote with their feet,” he says. Operators are forced to balance rising wages with customer expectations and the bottom line. Restaurateur Jon Dressler estimates he’s paying staff up to 30% more than five years ago. “Wages have increased — and we like that,” he says. His Rare Roots Hospitality Group employs roughly 250 workers across five restaurants. His most recent venture, Fin & Fino, opened last month in uptown. Dressler and wife Kim invested more than $1 million into the social seafood house concept. He concedes higher wages are not good for the bottom line, but restaurant workers have been underpaid for years. Too often the restaurant industry is seen as a stepping stone instead of a career, he adds. Dressler says he’s escaped many of the pitfalls tied to hiring by creating a culture that puts family first and inspires loyalty. Current employees can vouch for potential hires — a recommendation Dressler takes to heart— and management is promoted from within when possible. “Our growth has always been very strategic and centered around our people,” he says. Operating multiple restaurants allows him to invest in training and set expectations in advance of a new restaurant’s opening. That translates in the hospitality, service and overall experience Rare Roots establishments can offer, Dressler says. A Charlotte-based hospitality development group has plans to build hotels in two prominent locations in the Queen City. OmShera Hotel Group acquired the roughly 1.2-acre site at East Worthington and Cleveland avenues in the fall and will develop a six-story, 135-room Courtyard by Marriott hotel there. The site, in the Dilworth neighborhood, was previously planned to be a 128-room Kimpton hotel but those plans fell through. OmShera purchased the site from Catellus Group for $3.9 million in October. Kush Anandani, director at OmShera Group, said the Dilworth hotel will be a custom Courtyard as opposed to a more prototypical hotel. He said the hotel will be a very similar design as what was approved in Catellus' rezoning a few years ago, in which the hotel group worked closely with the Dilworth neighborhood. Anandani said the hotel will have an "urban, local community" feel. It will include a roughly 5,000-square-foot rooftop restaurant/bar concept that Erin Zitelli-Davis at The Chambers Group is marketing on behalf of OmShera, Anandani said. "We’re definitely looking for a local concept and something that brings out the flavors of Charlotte and Dilworth," he added. The Courtyard is expected to break ground by the end of this year, with a projected opening in the spring of 2020, Anandani said. ACC Commissioner John Swofford says Charlotte is now the home to the ACC Championship football game in December each year. House Bill 2 has been partially repealed for more than a year now, and Thursday marked another sign that big-ticket sporting events and economic development are returning to normal in North Carolina. The Atlantic Coast Conference announced Thursday morning it had signed a 10-year extension for the ACC Football Championship Game, which means the annual December matchup will continue to be held in Charlotte through 2030. ACC already had a contract through 2020. 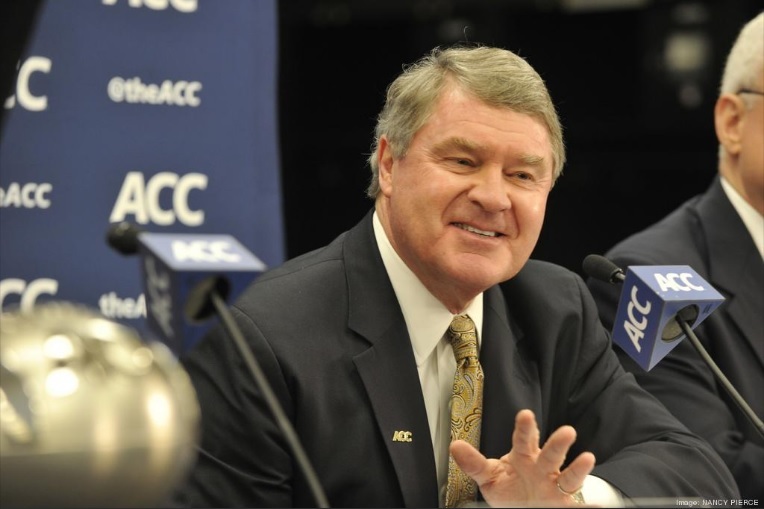 Swofford says making Charlotte the home for the ACC championship game makes sense. During the first seven games in Charlotte, attendance exceeded 70,000 fans. Plus, the home cities of all 15 ACC schools have direct flights to Charlotte Douglas International Airport, Swofford says. For those who want to drive to the ACC Championship during the first week in December each year, Charlotte is within 300 miles of eight of those schools. “Charlotte is in the heart of the ACC footprint,” Swofford says. Thursday’s announcement follows the one-year anniversary of HB2's partial repeal. In response to the 2016 passage of the controversial state law known as HB2, which barred certain protections for lesbian, gay, bisexual and transgender citizens, the ACC voted to relocate the football championship from Charlotte to Orlando, Fla., a mere two months before the 2016 game would have been played at Bank of America Stadium. That led to the lowest attendance in the championship’s 12-year history. The ACC Championship returned to Charlotte last year after HB2's partial repeal in late March of 2017. And the crowds came back. The contest between Clemson University and Miami University attracted a capacity crowd of more than 74,000. The 2017 game attracted 58,000 people to the Queen City. Those visitors filled the city’s hotel rooms and created a $40 million economic impact for a weekend of college football and fan appreciation, Webb says. Before last year's game, Swofford told CBJ that that the contract to play the ACC Championship in Charlotte would likely be extended in the spring.